...however, the micro:bit data never appears in S2Bot (and the status led in S2Bot never turns green). I tried rebooting, un/replugging the dongle, reinstalling S2Bot to no avail. As this happens on multiple devices (and the same micro:bit and dongle work on other Win10 PCs), it feels something systematic - if you have seen anything similar, tips and ideas on what might be wrong with the S2Bot setup/install more than welcome. What does this have to do with the picaxe microprocessor? I suspect when the OP refers to S2P they really mean S2Bot. ...however, the micro:bit data never appears in S2P (and the status led in S2P never turns green). Welcome to the PICAXE forum and we are sorry to hear you are having some problems. To communicate with a micro;Bit ensure you are using the S2Bot App and not S2P. 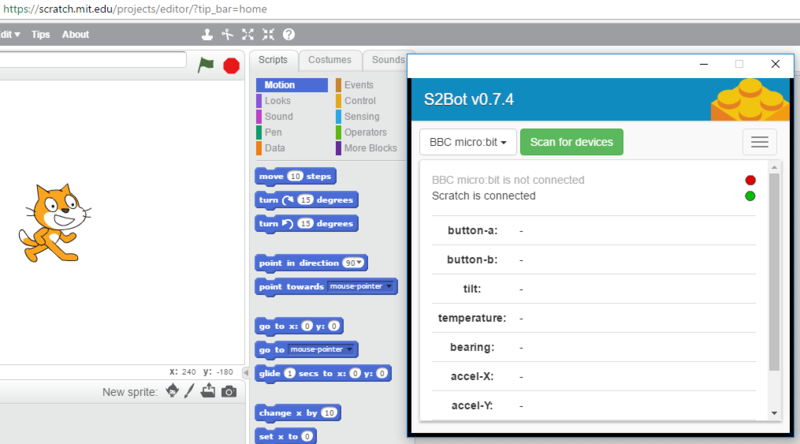 If you are using the S2Bot App it sounds like the issue is between the Scratch 2.0 environment and S2Bot App rather than a problem between S2Bot and your micro:bit. The Scratch on-screen status LED not going green suggests that it is unable to communicate with S2Bot. We are not sure why that would be. Are you using the Scratch 2.0 on-line editor via a web browser, or the off-line editor installed as a Windows app ? Yes, apologies, I was indeed referring to S2Bot (l changed the original post to reflect this). I don't get as far as Scratch (I'm using Scratch via Chrome). The connection between Scratch and S2Bot seems OK - it's the micro:bit data that doesn't show up (not just in Scratch, but in the S2Bot app either). Here is how the S2Bot status looks like after successfully scanning for a micro:bit and the C flashing after the connect. Normally, after a couple of seconds the accelerometer data starts flowing (and the first indicator light turns green), but in these cases, that never happens, even after longer waits or reboots. The exact same dongle+micro:bit combination works fine on other Win10 computers (we swap around as not everyone has a dedicated PC). I would be happy to debug, but have little idea where to look for any pertinent connection/data logs. Could it be that the micro:bit is not running the appropriate firmware required for communicating with S2Bot, is running some other firmware which allows it to be detected but not communicate ? The firmware may have been overwritten if the micro:bit has been used for something else it and it may be worth re-downloading it anyway to see if that improves the situation. To obtain the appropriate micro:bit firmware; launch the S2Bot App. Then from the menu button (top right) select the "Program micro:bit" option. Save the "microbit-s2bot.hex" file to your micro:bit, or save to disk then copy that file to your micro:bit. Its also worth remembering that the microbit can only (successfully) link to one device at a time (even though it will still appear in scans on other devices). Make sure it is not paring up to some other phone/ipad/computer etc etc instead.